Due to the limited capacity and high demand for this event, there are no more reservations available. We will hold the house for 10 minutes and seat anyone without a reservation on a FIRST COME, FIRST SERVED basis. Please be aware that if we reach capacity, we may need to turn patrons away. If you reserved a spot, but arrive after 6:30pm, your spot may have been given to another person. Looking forward to seeing you there! Kinetic Light is thrilled to get another chance to share DESCENT with the New York community because ten days before opening, all the performances were SOLD OUT. Join us for video, music and audio description of the premiere performance. Performed on an architectural ramp installation with hills, curves and peaks, DESCENT celebrates the pleasure of reckless abandon. 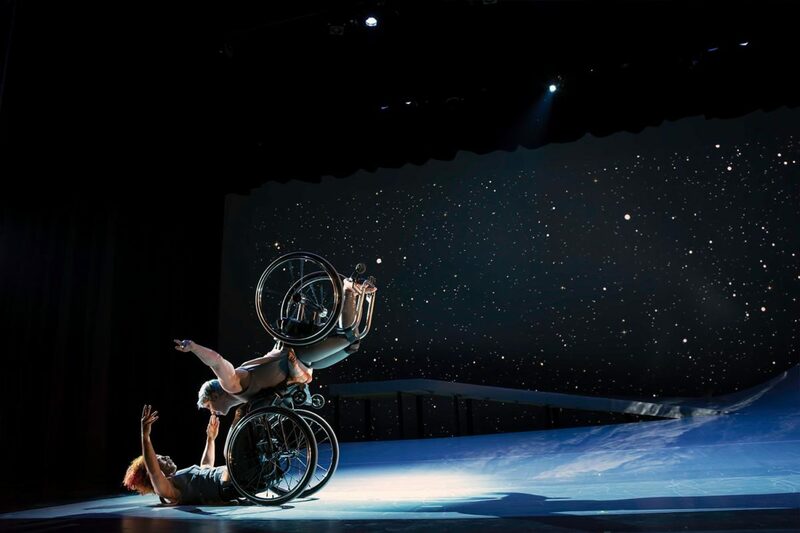 Obliterating assumptions of what dance, beauty, and disability can be, this evening-length duet takes audiences on a transformative ride. Andromeda and Venus, reimagined as interracial lovers, claim their desire as wheels fly within inches of the ramp’s edges. Their spines soften to taste the subtle pulls of gravity and arch into the sumptuous light. Dance workshops are not usually part of the Sorry I Missed Your Show series. With the support of The Mertz Gilmore Foundation, Kinetic Light is able to offer a free movement workshop on February 12 at 8:00 pm. This is your opportunity to learn some of the choreography and partnering developed for DESCENT by Alice Sheppard and Laurel Lawson. No ramps involved this time! All disabled dancers and athletes over 18 are encouraged to attend this free two hour workshop. You do not have to be a professional dancer to participate. Please share information about this event to people you think would benefit from the experience. If you have questions about workshop participation, please reach out directly to Alice via alice@kineticlight.org. Image Alt Text: Venus is flying in the air with arms spread wide, wheels spinning, and supported by Andromeda who is lifting from the ground below. Photo by BRITT / Jay Newman. Audio description and ASL interpretation provided.